According to a new report from NOAA March and year to date were the 2nd warmest on record for world. Arctic and Antarctic sea ice extents remain record-low, which is a subject we covered on The Big Wobble of course. NOAA goes on to report; hot on the heels of the second warmest winter in the 138-year record, March continued the global warm trend that could last well into this year — especially with increasing chances for the arrival of another El Nino by late summer or fall. The March 2017 average global temperature was 1.89 degrees F above the 20th-century average of 54.9 degrees, according to the analysis by scientists from NOAA’s National Centers for Environmental Information. This was the second highest for March in the 1880-2017 record, behind last year by 0.32 degrees. 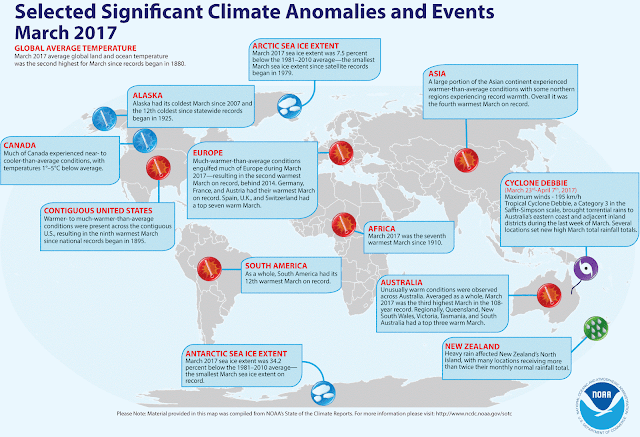 This also marks the first time the monthly temperature departure from average surpassed 1.8 degrees F in the absence of an El Nino effect in the tropical Pacific Ocean. The year-to-date average temperature was 1.75 degrees F above the 20th-century average of 54.1 degrees. This was the second-highest first quarter of the year on record, behind 2016 by 0.32 degrees F.
The average Arctic sea ice extent was 7.5 percent below the 1981-2010 average for March, and the average Antarctic sea ice extent was 34.2 percent below the 1981-2010 average. For both regions, this was the smallest March sea ice extent since the satellite record began in 1979. The Northern Hemisphere snow cover extent was 20,000 square miles below the 1981-2010 average, the 24th smallest value in the 51-year period of record. North America had its 20th smallest, and Eurasia was near the middle of the record. The globally averaged sea surface temperature was the second highest March on record, 1.28 degree F above average. 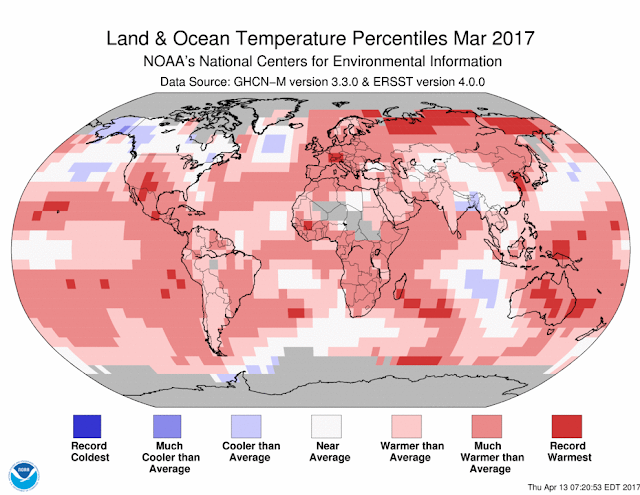 The globally averaged land-surface temperature for March was the second highest on record for that month, 3.56 degrees F above average.